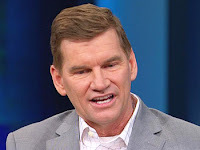 Disgraced evangelical leader Ted Haggard was on Oprah Wednesday smiling a lot (this picture from Oprah's website doesn't do him justice) to promote the HBO documentary about him. Haggard spoke about being a "heterosexual with issues." His biggest issue is dishonesty.